As a writer I’ve found it easier not to actually EXPECT support from anyone. It’s a mental and emotional trap to do so. Those people who have businesses that I’ve supported &/or presently support, or that I’ve extended certain courtesies, done things for and the like. Well, they weren’t gifted the blessing of my time or favor, in hopes of some eventual instance of payback displayed in a book sale or two. Nor was I hoping they’d end up “Shouting Me Out” promotionally via their social media pages. Would it help my efforts if they did? Without question it would! But, God Bless those people anyway. My strides in life as an Author/Poet/Writer are being supported by some amazing “PEOPLE” whose acquaintance I would never have had an opportunity to make, without first pursuing MY dream. Therefore, even giving attention to those who aren’t supporting me is sort of a slap in the face to those who are! At least, that’s how I see it. I had a mentor tell me years ago, “Your success in life will be perceived as some peoples failure! This is the reason they’ll find it difficult to throw their support behind your efforts”. So you see, complaining about their lack of support sort of feeds their hope that you won’t succeed – not to mention it validates their insecurities in life. Think about it this way, if your success depended on their support alone, well, you’d pretty much be a failure presently. And we know this isn’t the case, right? Focus on what matters, keep grinding, push yourself to the maximum and seek to persevere at all costs, regardless who supports you. Your blessings are YOUR blessings, designed for acquisition when the time comes. Value, Honor & Respect Them All! 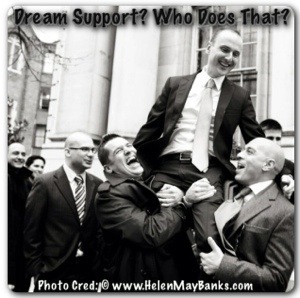 Sometimes, they’re disguised as a lack of support to spur focus & hard work. Those Dreams, Hopes & Desires are YOURS to bring to Life! Don’t You Dare Stop To Monitor Support, When There’s Plenty Of Work To Be Done Before Making That A Reality!